Carol Townend writes medieval romances for Harlequin Mills and Boon. She loves writing, although she would be the first to admit that what she loves best is having done it! The trickiest part for her is getting that first draft pinned to the page. A history graduate of London University, Carol has learned that the best way to get her going is to do some background research. And this is not just poring over dusty tomes in a library, or trawling the internet - though Carol does plenty of that too! She loves visiting castles, or ancient towns and cities and trying to peel back the layers to imagine places as they were in the past. Carol’s latest Palace Brides trilogy is set in Medieval Byzantium. The starting point for these books was a map of the Imperial Palace in Constantinople she found on Wikipedia. (Apologies for the slightly blurry resolution.) The map gives tantalising hints at why the Byzantine era was one of the most fascinating periods in history. There are glittering palaces. There’s a polo field. There are great reception chambers, and baths made from marble. Princesses would have walked through the Palace grounds, great retinues trailing in their wake. The paths and courtyards would have been crowded with lords and ladies, with generals and soldiers, with servants and slaves. 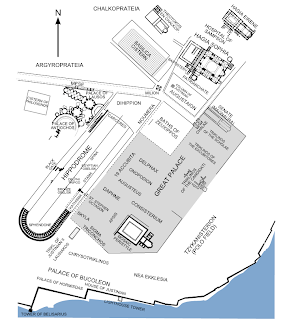 The City of Constantinople was built on the tip of a peninsular, and from the map you can see that the Great Palace was set close to the sea walls. There would have been fabulous views of the Sea of Marmara from some of the Palace windows! 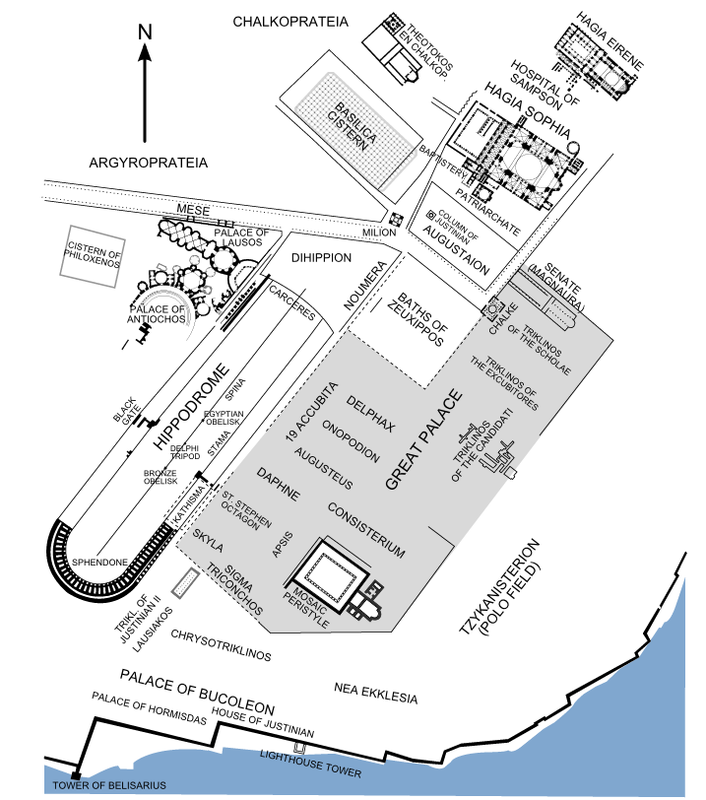 After finding this map, the idea for the Palace Brides trilogy was born. 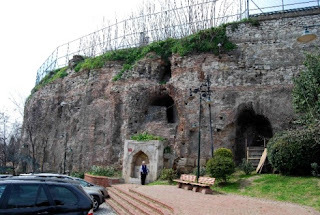 Carol visited Istanbul (the site of medieval Constantinople) to refine her ideas. And here are some of her photos. In the first one Carol is standing by the ruins of the Hippodrome where the entertainments (circuses, chariot races etc) were held. It gives some idea of the scale, the Hippodrome was HUGE! A scene in the first Palace Bride takes place outside the Hippodrome. Falling for the Forbidden Warrior! Sold into slavery, maidservant Katerina promised one day to repay the Princess who rescued her. Now that time has come, and Katerina must convince commanding warrior Ashfirth Saxon that she is her royal mistress. Spending balmy days and long sultry nights with this man make Katerina’s task increasingly impossible. How long will she be able to keep up her deception? And how long before she finds herself willingly bedded by this proud barbarian? Beauties of Byzantium – claimed by warriors! 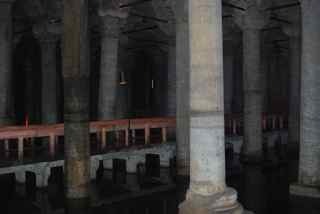 The next two photos were taken several feet below the streets of Istanbul, in the Basilica Cistern (this was the water supply for the Great Palace). The small photo shows lines of columns marching off into the distance; the larger one shows the giant head at the base of one of the columns. 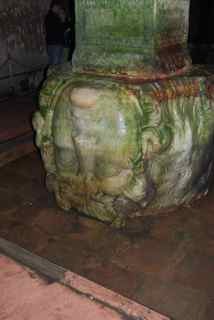 Going down into the cool, dark of the Basilica Cistern inspired a scene in the second of the trilogy, Chained to the Barbarian. Bound in chains, enslaved barbarian Sir William Bradfer stands proud in the Constantinople slave market. As a warrior, he’s trained in the art of survival. Lady-in-waiting Anna of Heraklea is betrothed to be married—against her will. Catching sight of the magnificent William, she finds a rebellious half plan forming in her mind. Anna can offer this captured knight freedom in return for his hand in marriage! 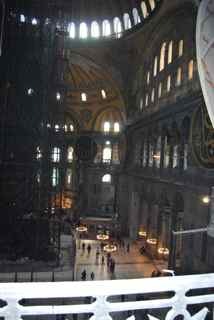 This photo was taken in the church of Hagia Sophia. The heroine of the third novel, Betrothed to the Barbarian is married there. Betrothed to the Barbarian is coming out in August 2012. The cover image and blurb for that aren’t ready yet.